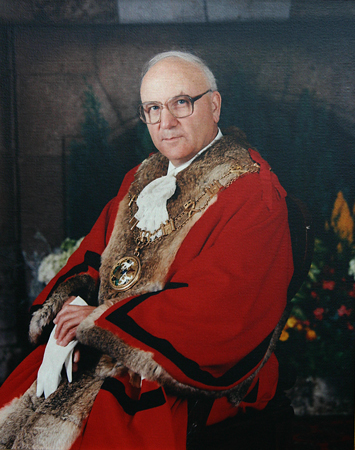 In May 1994, Ramon Yeo was the first member of the Yeo family to be elected as Mayor of Exeter. Exeter had the oldest 'Right Worshipful' Mayoralty in England after the City of London and Winchester, giving the Exeter Mayor a head position in all parades and ceremonial occasions. For example, when the Mayors and Lord Mayors of other cities were invited to Exeter to celebrate the 400th anniversary of County status in 1937, Exeter's Mayor was at the head of the procession into the Cathedral by virtue of his seniority. The Mayor is now elected each year from amongst the 40 Exeter City Councillors, and is supported by a Deputy Mayor. The Mayor becomes non political during their year of office but the Deputy Lord Mayor remains politically active. They have a busy engagement calender, attending in excess of 600 functions during the year. Each year the Mayor raises money for their chosen charity and attends a variety of fundraising events - an average of £15,000 per annum is raised.  The portrait of General Monk who was born at Great Potheridge at Merton and was made High Steward of Exeter in 1662, the year of the Act of Uniformity and the Book of Common Prayer. In that same year the Vicar of Merton, Bartholomew Yeo , having refused to conform was deprived of his living and was succeeded by his nephew, William Yeo , from whom he descended. George Monk's sister, Dorothy was the grandmother of Paul Yeo of North Petherwin who had married Elizabeth, daughter of George Yeo of Huish.  The portrait of Princess Henrietta Anne , daughter of King Charles I , who was born in Exeter in 1644. In 1644 the Sheriff of Exeter was a Richard Yeo . During his year the High Sheriff of Devon was the Countess of Arran whose father was Earl Fortescue of Castle Hill near Chittlehampton. They attended many functions together and lunched with Lady Arran at Castle Hill a few times. 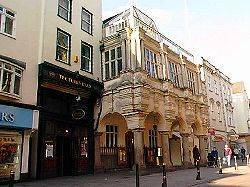 One particular function was a visit to Exeter by Princess Anne on 20th February 1995. The Sheriff of Devon in 1644 was a Fortescue and the Sheriff of Exeter was Richard Yeo ! Three hundred years later the Sheriff of Devon was a Fortescue and the Mayor of Exeter was a Yeo! It was also his pleasure to attend many functions with Lord and Lady Clinton and there were many opportunities to discuss the historic family connections. When the year was over Lady Clinton invited him and his wife to a family lunch at Heanton Satchville, the estate which had previously belonged to the Yeo family... Before lunch Lord Clinton took him on a tour of Huish and Petrockstowe churches to see the important Yeo memorabilia. Ramon is an accomplished organ player and has been organist at Withycombe Raleigh Parish Church for a few years. He is the Honary President of the Bach Society in Exeter and music is his first love outside his family. The origin of the Exeter Bach Society dates from the early 1950's when as a young organ student, Ramon , was being taught by Reverend John Dams, Priest Vicar at Exeter Cathedral, who was an avid student of Bach and an accomplished performer of his organ works. Ramon spent the next fifty years exploring Bach's music and as a subscriber to the Neue Bach Ausgabe has collected scores of the complete works. In 1995, as Mayor of Exeter, the now sixty-year old organist had the opportunity of calling a public meeting to determine if there was support for forming a Bach Society in Exeter. The meeting took place on Bach's birthday, 21st March, and was attended by around twenty five people who elected a steering committee. After ten years as Chairman of the Society, Ramon Yeo has retired but continues to take an active interest in the Society as Honorary President. Ramon was very interested in finding out more about his Yeo roots and we met in the Exeter Record Office whilst he was researching the family .During his term as mayor I was invited to the Guildhall for tea to compare family history notes. Also present were Colin Yeo and his wife, who descend from the Swimbridge line. The tea was served in the Mayor's chamber on the ancient silver trays with the best china and cutlery and was an awesome experience. A photograph was taken by the Exeter Express & Echo reporter and this appeared on the newspaper's front page. Ramon and Judith's children, all born in London, are Kathryn , Timothy, Julian and Jeremy. Tim is the deer park specialist at Longleat and frequently appears on television on the BBC 'Animal Park' programme which is shown at various times and regularly includes contributiions from 'head of section Tim Yeo'. Ramon is very proud of his Yeo roots. He descends from the Robert Yeo & Johane Arscott of South Tawton. Robert was the grandson of William Yeo & Frances Cliffe, who was the rector of Merton until he died in 1667. This Reverend William Yeo was the grandson of John Yeo & Rebecca Rolle. Ramon's grandfather, Edwin Yeo was born in 1867 in Spreyton, the third child and second son of Robert Yeo and Ruth Ponsford and by 1881 Edwin had been apprenticed to William Hopkins , a boot and shoe repairer Around 1891 he moved to Withycombe Raleigh where he married Mary Elizabeth Ann Palmer on the 28th August, 1895 in the Chapel of Holy Trinity, Littleham, Exmouth. Mary's father was Charles Palmer, a jeweller. By 1905, when their son Edwin Ernest was born, they were living at 13, The Parade, Withycombe Raleigh, Exmouth and Edwin was by then a master bootmaker. Ramon's father, Edwin married Gladys Grant and moved to Heavitree and was a motor engineer and later a corporation omnibus driver Ramon was born in 1935 in Exeter and his first wife was Judith Mason and his second Mary Atwell. Ramon's line of descendancy goes back to William and Ellen Grenville and because of the marriage of John Yeo of Hatherleigh to Rebecca Rolle, who was the daughter of Margaret Yeo, the sole heiress who passed all the Yeo estates into the Rolle family, it includes descendancy from many of the influential Devon families, such as the Grenvilles, Walronds, Fulfords and Fortescues. Many Thanks to Ramon for the biography and photographs and for sharing these with us.